Hi. I need some advice on mounting a giant loop great basin on a 2011 ktm 450. Im having huge problems securing it to the back fender. I also need the bag repaired. Because i couldn’t mount it properly, one of the straps completely tore off the back. Have you got any recommended repairers in Victoria Australia. I bought your stainless mounts and attached them to the frame where my legs are. Problem is the boots are wearing the straps away at the mount. One of the straps also worked its way thru the groove and the bag completely came off the bike. I was thinking of welding the mount closed and just feeding the strap thru. Also was going to hammer the mount straight so it doesnt expose the strap to any wear. Also have a 2008 250 with a coyote which seems ok. If you have any advice on this setup, it would be appreciated also. First, thank you very much for choosing Giant Loop for your adventures! I have CC’d our Australian distributor, Adventure Moto, so they can follow up with you regarding local repair options, etc. Adventure Moto has been our exclusive distributor in Australia since 2009, and we appreciate you supporting them with your business. Your dirt bike is not designed to carry a passenger – it is not equipped with passenger pegs. See Packing Systems diagram. The Great Basin Saddlebag sits on the passenger seat and anchors to the passenger peg mounts in a vertical position. The Coyote Saddlebag is specifically designed for dirt, dual sport, endure and other bike types that are not built to carry a passenger. It mounts behind the seat and anchors to the frame/subframe/GL Mounts in a diagonal position. So, yes the Coyote Saddlebag fits both of your dirt bikes perfectly. I you need additional packing capacity for the Coyote Saddlebag, add a Rogue Dry Bag and 2 Possibles Pouches. Or, position some of your gear on the front of the bike with a Diablo Pro Tank Bag, Zigzag Handlebar Bag, Pannier Pockets and/or Fender Bag. Regarding the GL Mounts – please see the attached photo of the Mount installed on the exhaust side of our KTM 500 EXC. Giant Loop’s stainless steel GL Mounts installed with round button-head bolt and anchor strap wrapped around mount to protect boot and pant leg from abrasion. Note that we have replaced the stock bolt with a button head bolt to help prevent wear from the square-edged bolt. Also please note how we wrap the extra webbing around the mount to protect our pants/boots from abrasion. These are simple steps that will instantly eliminate abrasion issues. 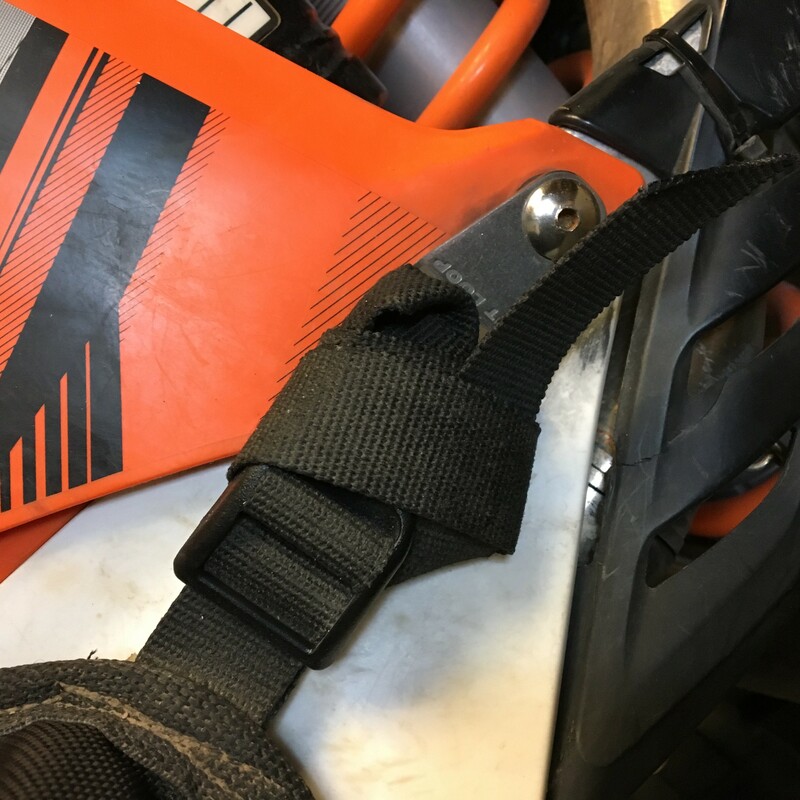 With respect to your strap coming loose: The Mounts are designed for the webbing anchor strap to pull in a straight line, not at an angle. In our laboratory tests of the linear pull strength of our Mounts, the metal will actually bend before the strap pulls through when the force is in a straight line. The root problem may be that the Great Basin Saddlebag doesn’t mount in the correct position on your bikes, so the webbing anchor strap is pulled at angle. If you never want the strap to come out of the Mount even when it’s pulled at angle, then use metal tri-glide buckles to lock the strap into the Mount. We and our customer have ridden many thousands of miles with our Saddlebags mounted without the GL Mounts. They are intended to be a convenience – they are not necessary components. If they are causing you problems instead of solving problems, you might consider simply anchoring the straps to the frame/subframe as we have done for year before we started making the GL Mounts. I hope I’ve answered your questions and addressed your concerns. Please share this information with your riding friends and help us help riders avoid problems that are easily solved. And please follow up with Adventure Moto – and give them your business.